Marshall Electronics Optical Division - High Tech Zoom Pinhole Lenses made for Marshall Electronics line of zoom pinhole lenses. 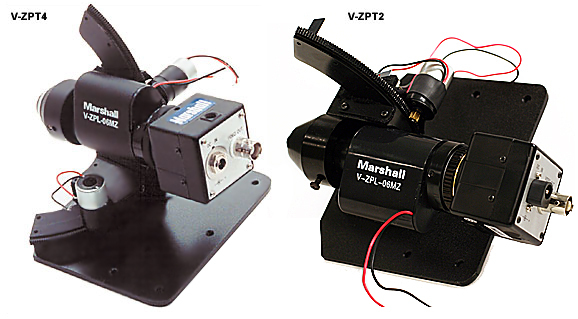 These unique motorized pan and tilt mechanisms are specially designed by Marshall Electronics for our line of zoom pinhole lenses. They pan either back and forth or up and down (V-ZPT2) or both (V-ZPT4) at approximately 120 degree angle each axis. Recommended lenses are the motorized pinhole lenses, the V-ZPL06MZ and V-ZPL1050MZ. With these lenses plus this unique mechanism, you can pan and tilt your camera and zoom in and out to a particular subject at 4-20mm (V-ZPL06MZ) or 10-50mm (V-ZPL1050MZ) range. Units work with 5 VDC of power @500mA (not included) and are capable of lifting up to a 100g camera. Ideal cameras to use are C/CS mount B/W or color board cameras or enclosed cameras such as the V-1055-BNC (shown left). The V-ZPT2 has 2-way movement and the V-ZPT4 has 4-way pan and tilt. Each comes with the necessary motors with leads ready to be wired to a control source (control source not included or available). Some of its unique features are: very low motor noise; compact in size; and easy to install. Power supply not included.